September is remarkable month in Canada. Most of us think of it for back to school, and the change of season. 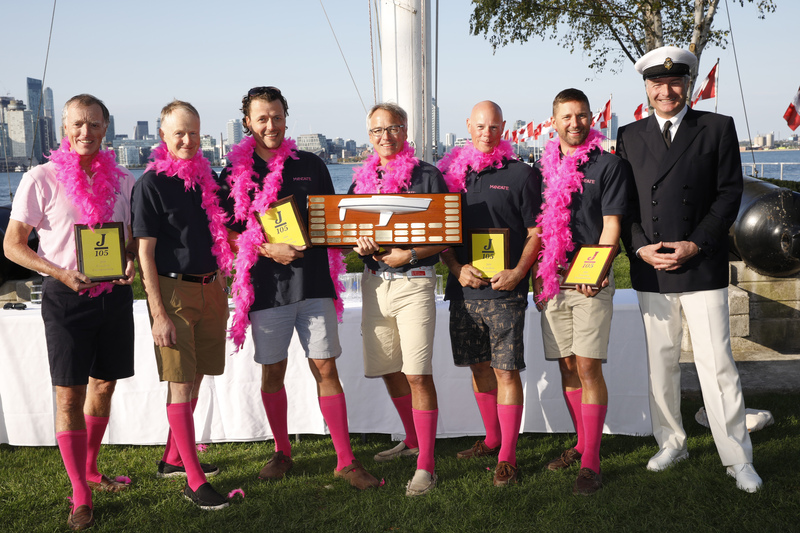 For the Canadian J105 fleet, it brings on the finale to our season, the championship event, the highlight of the year and this year did not disappoint. Friday had been hyped as a heavy wind affair as we watched the path of hurricane Florence wreck havoc through the Carolinas and turn north. There was talk on the dock as to at what sustained wind strength should racing be cancelled. In fact, Florence dissipated, though the isobars over Southern Ontario narrowed significantly. As we set out on Friday morning we experienced18 knts of wind building to 22knts from the SSW. A heavy sea built up from across the lake. Challenging conditions indeed, but the J105 is the best keel boat class for a reason. It performs brilliantly in these challenging conditions. Race one start saw 17 boats pitching up and down with flogging sails. Boats that set up early and high near the RC boat found themselves being denied entry at the windward end as the east to west current carried the fleet to the line earlier than expected. The key decision was when to pull the trigger to sheet in and go. Some boats found themselves being called over early. Heartbreak for Jamaica Me Crazy, who for brief moment, had the whole fleet tucked away below them. Mandate got her nose out, hiked hard and was able to tack and cross followed by Hey Jude. Starcross was early on back in the pack and was a victim of a port tacker who failed to duck the additional seven feet necessary to avoid a collision. Despite that incident, they were able to move into second place on the first run before being passed back by Jude. The downwind legs were epic sailing with fantastic surfing conditions. The crews worked hard to get the boat up on top of the waves providing big rewards for the boats who were able to literally surf by other competitors at 15knts. Though a few spinnakers were shrimped, blown out and shredded, I don’t think too many crews will forget the experience of high excitement downwind sailing. Races two and three on Friday were sailed in similar conditions with a slight build in velocity. The compass was rock steady, and the seas continued to roll down the lake. Mandate, Hey Jude and Jamaica rounded out the top 3 in race 2. In race 3 Mandate, Usual Suspects and Hey Jude claimed the podium, despite Jude sailing the whole race with no spinnaker. At this time there was a developing trend at the top of the fleet. Fresh off a North American Championship win Mandate revelled in the windy conditions. Hey Jude was challenging and Suspects, Starcross and Jamaica rounded out the top 5 at the end of day 1. Unfortunately, someone turned off the fan for Saturday. Race 4 was away in a dying NNE breeze that was very shifty and puffy and continued to fade over the course of the race. Mandate and Suspects worked the left side off of the starting line, which produced a two-boat battle at the front with Mandate hanging on downwind for a ¼ boat length win. Is it possible that the narrow victory was made certain by the skipper of Suspects, just before the finish line, going to the back of the boat in the light air to crank on the backstay thinking that they had another upwind leg to go? We will never know. After two attempts at starting a second race of the day in the dying breeze the PRO, Mike Milner, sent the fleet back home. Sunday brought no wind in the morning, so the fleet remained on shore for a few hours. The RC was finally able to get a race underway in 6knts of breeze out of the SE. Jude and Mandate worked the middle left on the first beat to come out on top at the first mark. A good battle ensued with Mandate taking over the lead on the last downwind. With Starcross placing 3rd and Suspects 8th in the race, the former managed to slip by the latter in the standings to take third overall. Jamaica claimed fifth overall. The Canadian Championship is a well-run event and Doug Bullock is a true workhorse. The whole fleet is grateful for his continued efforts. The Saturday evening festivities was a huge success with Errol Blackwood and his band transforming the club into a reggae goombay smash. We should all be proud of the effort to share our good fortune with the Broad Reach Foundation. Thank-you Doug Bullock and Susan Reisler for organizing the silent auction and Michael Mountford for going above and beyond in finding sponsorship. Let’s continue to build our class on and off the water. We will see you next season on the water and at the AGM in November.